Lieutenant General Maurice F. Casey was director for logistics, Organization of the Joint Chiefs of Staff. He was the principal adviser to the Joint Chiefs of Staff on joint and combined logistic matters and provided assistance to the Joint Chiefs of Staff in carrying out their logistic responsibilities as the military staff in the chain of operational command with respect to unified and specified commands. General Casey was born in 1920 in Chicago, Illinois, where he graduated from Mount Carmel High School. He attended the University of Chicago and the University of Miami. In March 1942, he entered the Army Air Corps as an aviation cadet and in January 1943 completed his pilot training and was commissioned as a Second Lieutenant. His first assignment was with the 43d Bombardment Squadron at Gowen Field, Idaho, as a pilot instructor and later as an operations officer. In July 1943 he became operations officer for the 701st Bombardment Squadron at Sioux City Army Air Base, Iowa. He moved with the squadron to England in November 1943, becoming squadron commander, group operations officer and deputy group commander, and participating in combat missions in the European theater of operations. General Casey returned to the United States in June 1945 and directed postwar operations and maintenance for a military air transport group at Stockton Field, California. He voluntarily went on inactive status in 1946 and became a member of the Air Force Reserve. In 1948 he attended the Air Command and Staff School at Maxwell Air Force Base, Alabama. While on inactive status, he was a chief pilot and partner in a Miami, Florida, charter airline. General Casey was recalled to active military duty in August 1950, during the Korean War. He was assigned as commander of the 435th Troop Carrier Wing at Miami International Airport and in December 1951 went to the Far East, where he commanded the 483d Troop Carrier Wing. In June 1954 he was assigned as an operations staff officer in Headquarters U.S. Air Force, where he became chief of the Air Traffic Control Branch and a member of the technical division of the U.S. Air Coordinating Committee, in the Office of the Deputy Chief of Staff for Operations. General Casey became the deputy director of Air Force information services in the Office of the Secretary of the Air Force in July 1955. From July 1958 to July 1961, he served as military adviser to the Royal Danish air force and chief of the Air Force Section, Military Assistance Advisory Group, Denmark. In August 1961 General Casey entered the National War College, Washington, D.C. Upon graduation in June 1962, he was reassigned to the Office of the Secretary of the Air Force as deputy director of information. In August 1965 he assumed command of the 1501st Air Transport Wing (redesignated 60th Military Airlift Wing) at Travis Air Force Base, California. General Casey was named director of transportation, Office of the Deputy Chief of Staff, Systems and Logistics, Headquarters U.S. Air Force, in August 1968. He was transferred to the Organization of the Joint Chiefs of Staff as deputy director for logistics (strategic mobility) in August 1973. He assumed his present duties as director for Logistics, OJCS, July 1, 1975. He has more than 12,000 jet and conventional flying hours. He was airline inspector for the Civil Aeronautics Administration from 1947 to 1950, and holds certificates as civilian airline transport pilot, flight instructor, and as an aircraft dispatcher. His military decorations and awards include the Distinguished Service Medal, Legion of Merit with four oak leaf clusters, Distinguished Flying Cross with two oak leaf clusters, Bronze Star Medal, Air Medal with five oak leaf clusters, Joint Service Commendation Medal, Distinguished Unit Citation Emblem with oak leaf cluster, Air Force Outstanding Unit Award Ribbon with two oak leaf clusters, Republic of Korea Presidential Unit Citation Ribbon, French Croix de Guerre with gold star, Republic of Korea Military Merit Ulchi Medal, British Distinguished Flying Cross, Greek Medal for Distinguished Service, and the Nationalist China Air Force Pilot Wings. He was promoted to the grade of lieutenant general July 1, 1975, with date of rank June 30, 1975. Of Satellite Beach, Florida, and McDowell, Virginia, died Thursday, November 11, 2004, at Augusta Medical Center. He was born June 3, 1920 in Chicago, Illinois, the son of the late Maurice Frances and Marie (Rowan) Casey. 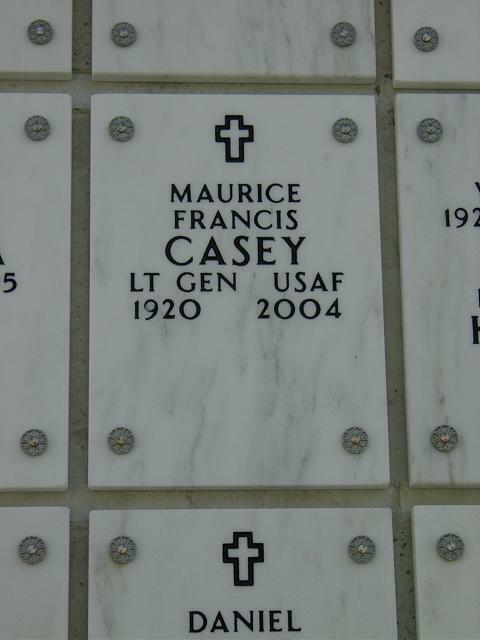 General Casey retired in 1977 from Joint Chiefs of Staff after 35-1/2 years service in the U.S. Air Force. On October 12, 1946, he married Dora Bell Neubert. He is survived by his wife; three daughters, Faith Maureen Horton of Kensington, Maryland, Shirley Marie Casey of Fairfax, Virginia and Georgeanne Armstrong and husband Mike of McDowell, Virginia; two sons, Maurice Frances Casey, III and wife Diane of Marshall, Virginia, and Michael Joseph Casey and wife April of Lavonia, Georgia; 12 grandchildren, two great-grandchildren and a brother, Kevin Rowan Casey of Whittier, California. A memorial service will be conducted at Arlington National Cemetery at a later date. Memorial contributions may be made to St. Jude's Children's Research Hospital, 501 St. Jude's Place, Memphis, Tennessee 38105. Please write "Memorial Account Number 561 545 60" on donations.